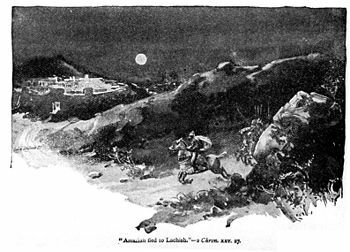 Amaziah flees to Lachish, where he was killed. Amaziah of Judah (אמציה) was a king of Judah, the son and successor of Joash, and the father of Azariah (Uzziah). His mother was Jehoaddin of Jerusalem. William F. Albright has dated his reign to 800 B.C.E.-783 B.C.E., while E. R. Thiele offers the dates 796 B.C.E.-767 B.C.E. He is considered by the biblical writers to be one of the good kings, but his history presents a much more checkered picture. After avenging his father's murder by assassins, Amaziah moved to regain the territory of Edom, which had reasserted its independence from Judah two generations earlier. However, pressure from Judah's prophetic party forced him to break his alliance in this endeavor with the Kingdom of Israel, causing hard feelings with his northern neighbor. He nevertheless won a major victory over the Edomites. Afterward, however, his veneration of the gods of Edom earned him a prophetic condemnation. Seeking to punish Israel for raids against Judean towns and other insults, Amaziah next made war against the north. This ill-advised step resulted in disaster as he was soundly defeated and captured, and Jerusalem was sacked. He died years later at Lachish as a result of a conspiracy which placed his son, Azariah (Uzziah) on the throne in Jerusalem. As a king in the Davidic lineage, Amaziah is one of the forefathers of the coming Jewish Messiah, and of Jesus Christ in the Christian tradition. Amaziah lived during a time when a bitter dispute raged in Judah and Israel between the "Yahweh-only" party, which insisted that no other god but the Lord must be worshiped, and the more cosmopolitan leaders who favored incorporating other national and tribal deities into public worship. In the north, a Yahweh-only coup had been instigated by the prophet Elisha, placing on the throne the ruthless King Jehu, who massacred all the descendants of Ahab and Jezebel, killing a number of the allied royal house of Judah in the process, including Judah's King Ahaziah. Jehu also slaughtered the northern priests of Baal and put and end to Baal worship in his kingdom. However, this was not enough for the southern partisans of Yahweh, who insisted that he also dismantle the northern shrines at Bethel and Dan, whose golden bull-calf statues they declared idolatrous. In reaction to Jehu's coup in the north, Ahaziah's mother Athaliah, who also happened to be the daughter of Ahab and Jezebel, seized the throne in Jerusalem, slaying her own rivals and allowing Baal worship to flourish alongside that of the Lord until a coup led by the priests of Temple in Jerusalem placed her young grandson Joash (also called Jehoash of Judah) on the throne. The temple of Baal was promptly destroyed and Athaliah was slain. Joash, who began to reign at the age of seven, dutifully followed the policies of his priestly mentors for the most part, but he earned the criticism of the authors of the Books of Kings for not outlawing worship at the local high places, which were unsupervised by the Jerusalem priests. After Joash, too, was assassinated, Amaziah became king at the age of 25, amid the hopes of the Yahweh-only group that he would act more decisively for their cause. As soon as Amaziah's kingdom was firmly established, he slew the murderers of his father (2 Kings, 14:5). Contrary to custom, he permitted their children to live, an act for which he is praised by the biblical writers as being in accordance with the Deuteronomic principle that children are not to be punished for the sins of their fathers. His reticence in this regard may also be explained by the fact that his grandmother Athaliah's entire family—including 60 of Amaziah's male cousins—had been slain by Jehu, and Athaliah had retaliated by killing all of Amaziah's more immediate kin in Jerusalem until she herself was put to death by his uncle, the priest Jehoiada. 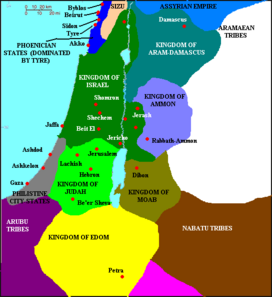 Early in his reign Amaziah raised a large army, including a reported 100,000 mercenaries from the northern Kingdom of Israel, to reconquer Edom, which had rebelled during the reign of his great-grandfather Jehoram (2 Kings, 2:20-22). However, Amaziah found himself confronted by an unnamed prophet who instructed him not to ally himself with the northern kingdom, saying: "The Lord is not with Israel—-not with any of the people of Ephraim." Amaziah objected that he had paid the nearly 100 talents of silver (more than three metric tons) for their services, but in the end he acquiesced. The Israelites were furious at the insult, a factor in the later disastrous war between Judah and Israel. Nevertheless, Amaziah achieved a major victory over the Edomites, killing 10,000 of them at the Valley of Salt. The chronicler adds that another 10,000 were taken alive and thrown to their deaths from a cliff (2 Chron. 25:11-12). Meanwhile, the dismissed northern troops vented their resentment at not being able to participate in the battle by raiding Judean towns, killing 3,000. Since he was now the ruler of Edom as well as Judah, Amaziah carried home religious artifacts taken from Mount Seir and honored them as king, an act for which another unnamed prophet condemned him with a prediction of doom. A thistle in Lebanon sent a message to a cedar in Lebanon, 'Give your daughter to my son in marriage.' Then a wild beast in Lebanon came along and trampled the thistle underfoot. You say to yourself that you have defeated Edom, and now you are arrogant and proud. But stay at home! Why ask for trouble and cause your own downfall and that of Judah also? The insulted Amaziah rushed into a disastrous battle against Jehoash's forces at Beth-shemesh, and a humiliating defeat overtook his army. Amaziah was captured, a large section of Jerusalem's wall was broken down, the Temple and the palace were looted along with the city, and hostages were carried to Israel's capital, Samaria. He reportedly lived another 15 years until he, like his father, was the victim of assassins. He was slain at Lachish, to which he had fled, and his body was brought upon horses to Jerusalem, where it was buried in the royal sepulcher (2 Kings 14:19). He was succeeded by his son Azariah (called Uzziah in Chronicles). Although Amaziah reclaimed Judah's sovereignty over Edom, he launched a disastrous fraternal war against the northern Kingdom of Israel, exacerbating a long history of bloodshed between the two formerly united kingdoms. This enmity would never be overcome, as Israel was destroyed in 722 B.C.E. by Assyria. Amaziah's son Azariah/Uzziah had a long and fairly successful reign, in which the prophet Isaiah began his famous ministry. Like many of the kings of Judah, Amaziah's most lasting legacy may be that he continued the unbroken line of the Davidic dynasty, which did not end until the Babylonian Exile of 586 B.C.E. In both Jewish and Christian tradition, he is considered one of the ancestors of the Messiah. Albright: 800 B.C.E. – 783 B.C.E. Thiele: 796 B.C.E. – 767 B.C.E. History of "Amaziah of Judah"
This page was last modified on 30 October 2012, at 23:30.